Rebar processing equipment performs several functions such as cutting, bending, straightening, and de-coiling on the reinforced bar known as rebar. Rebar has numerous applications in the construction industry based on its different shapes, size, and quantities. This machine is suitable for contractors or construction companies to carry out different operations on rebar according to their requirements. The growth of the construction industry worldwide is expected to boost the demand for rebar processing equipment. China, India, and the U.S. are expected to be major contributors to this growth due to an increase in infrastructure activities by private and government organizations. Rebar is one of the major components in construction activity, expected to encourage the demand for rebar processing equipment. Additionally, technological advancements increase productivity by reducing the time cycle for rebar processing. Automation in the rebar processing industry is anticipated to drive the market in the coming years. A major factor expected to hamper the growth of the rebar processing equipment market is the cost of the equipment. Small and medium enterprises are not able to afford huge investments. Additionally, unfavorable economic conditions create volatility in the real estate sector. This scenario is anticipated to obstruct market growth of rebar processing equipment across the world. The rebar processing equipment market has been segmented based on type, operation, end-user, and region. Based on type, rebar processing equipment can be categorized into bar bending machine, bar shearing machine, bar de-coiling and straightening, and others. Others segment includes radius bending machine, stirrup bending machine, etc. Bar bending machine is the most common machine used in the construction industry and steel industry. It has the highest market share compared to others and is expected to maintain the same in the coming years. Based on operation, the rebar processing equipment market is bifurcated into semi-automatic and fully automatic. Fully automatic segment dominates the market due to its convenience and efficiency and is anticipated to retain the share during the forecast period. Based on end-user, the market is segmented into steel producers, steel product manufacturers, and construction/engineering contractors. Construction segment is expected to remain dominant in the coming years. Development of smart cities in emerging economies, and growth in demand for steel products in infrastructure and real estate sector are a major driver. 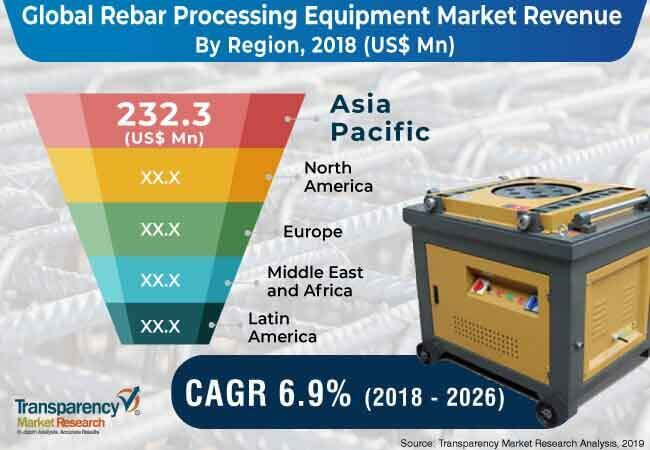 Based on region, the rebar processing equipment market can be segmented into North America, Europe, Asia Pacific, Middle East & Africa, and South America. Growing infrastructure and construction activities worldwide is encouraging the construction material market. The U.S. in North America and China and India in Asia Pacific account for major share of the growth in the construction industry. The rebar processing equipment market in these regions is anticipated to expand at a significant growth rate during the forecast period. United Kingdom, Japan, Canada, Germany, and Indonesia are also showing growth in the construction market, thereby leading to growth of the rebar processing equipment market. Middle East & Africa is also anticipated to see increased demand for rebar processing equipment as it is widely used for bar cutting and bending. The rebar processing equipment market is influenced by the presence of many local and regional companies. Key vendors operating in the global rebar processing equipment market include Jaypee Group, Schnell Spa, Ltd., Gensco Equipment, EVG Entwicklungs- und Verwertungs-Gesellschaft m.b.H., KRB Machinery, Eurobend, PEDAX, Ltd, Henan Sinch Machinery Co., Ltd, Toyo Kensetsu Kohki Co., TJK Machinery (Tianjin) Co, and Everest Equipment Private Limited. These players are estimated to face stiff competition due to the presence of a large number of local and regional players. Key players are mainly focusing on research & development activities and product innovation in order to strengthen their presence in the market. The rebar processing equipment market report provides analysis for the period 2016–2026 wherein the period from 2018 to 2026 is the forecast period and 2017 is the base year. The report covers all the major trends and technologies expected to play a key role in the growth of rebar processing equipment over the forecast period. It also highlights the drivers, restraints, and opportunities expected to influence market growth during the said period. The study provides a holistic perspective on the growth of the rebar processing equipment market throughout the above mentioned forecast period in terms of revenue (in US$ Mn and Thousand Units), across different geographies including Asia Pacific, South America, North America, Europe, and Middle East & Africa (MEA). The market overview section of the report demonstrates the market dynamics and trends such as the drivers, restraints, and opportunities that influence the current nature and future status of this market. An incremental opportunity analysis has also been provided for every geographic region in the report in order to give a thorough analysis of the overall competitive scenario of the rebar processing equipment market, globally. Moreover, the report provides an overview of the various strategies of key players present in the market. Product definition chapter helps in understanding different product types and operations of rebar processing equipment along with their end-use segments which are included in the report. Based on type, the global rebar processing equipment market has been segmented into bar bending machine, bar shearing machine, bar de-coiling and straightening, and others. Others segment includes radius bending machine, and stirrup bending machine. Furthermore, the market is classified by operations which includes semi-automatic and fully automatic. By end-use, the market is segmented into steel producers, steel product manufacturers, and construction/engineering contractors. Thus, the report provides in-depth cross-segment analysis of the rebar processing equipment market and classifies it into various levels, thereby providing valuable insights at the macro as well as micro levels. The report also highlights the competitive landscape of the rebar processing equipment, thereby positioning all the major players according to their geographic presence and recent key developments. The comprehensive rebar processing equipment market estimates are the result of our in-depth secondary research, primary interviews, and in-house expert panel reviews. These market estimates have been analyzed by taking into account the impact of different economic and consumption factors along with the current market dynamics affecting the growth of the rebar processing equipment market. On the basis of country, the North America market is divided into the U.S., Canada, and Rest of North America. Similarly, the Europe market is divided into U.K., Germany, France, and Rest of Europe. Asia Pacific has been segmented into China, Japan, India, and Rest of Asia Pacific. Middle East & Africa covers the G.C.C., South Africa, and Rest of Middle East & Africa. Similarly, South America region includes Brazil and Rest of South America. The report provides all the essential information required to understand the rebar processing equipment market and its types. Furthermore, Porter’s Five Forces analysis explains the factors which are currently affecting the rebar processing equipment market. The report also provides the value chain analysis for the rebar processing equipment market which explains the participants of the value chain. Jaypee Group, Schnell Spa, Ltd., Gensco Equipment, EVG Entwicklungs- und Verwertungs-Gesellschaft m.b.H., KRB Machinery, Eurobend, PEDAX, Ltd, Henan Sinch Machinery Co., Ltd, Toyo Kensetsu Kohki Co., TJK Machinery (Tianjin) Co, and Everest Equipment Private Limited are some of the major players operating within the global rebar processing equipment market profiled in this study. Details such as business strategies, recent developments, and other such strategic information pertaining to these players have been duly provided as part of company profiling. The rebar processing equipment market is segmented as below.